© 2006-2017, Kevan Hashemi, Open Source Instruments Inc. Warning: When you plug the A3008 into the LWDAQ, make sure the READY light starts flashing. If not, press the reset button on the LWDAQ Driver to cycle the power. If you don't want to reset the LWDAQ Driver, unplug the Spectrometer and plug it in again until the READY light starts flashin. Warning: The A3008 can interefere with an SCT data receiver, generating bad messages on channel fifteen. Set the A3008 daq_dac_value to 0 to stop the bad messages. The RF Spectrometer (A3008) measures RF power in 3-MHz windows between 850 MHz and 1100 MHz. If you connect the A3008's RF input to an antenna, the A3008 will measure the power spectrum of RF signals arriving at the antenna with 1-MHz resolution and sensitivity 10 pW (−80 dBm). You can use the A3008 to measure average power in the window, peak power in the window, or the power received from a subcutaneous transmitter. To measure the power received from a subcutaneous transmitter, we place the A3008's window at the center frequency of the transmitter. Our subcutaneous transmitters emit a 7-μs burst of power every few thousand microseconds, which is a challenging signal for a spectrometer to detect. The A3008 is designed to detect these burst signals, as well as to measure interference in the 902-928 MHz ISM band. 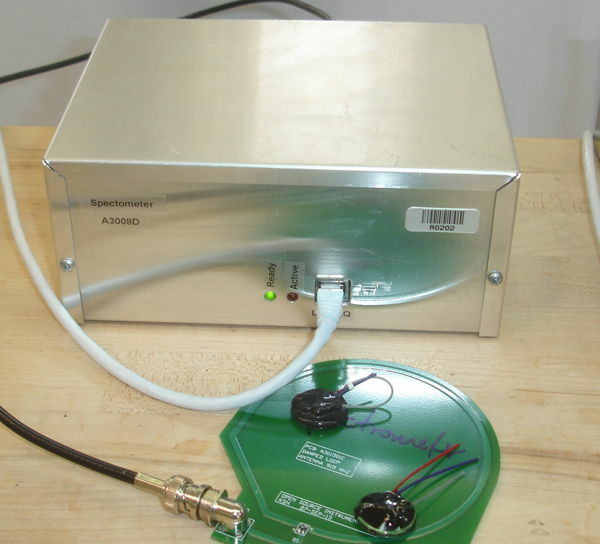 Figure: RF Spectrometer (A3008D) with Loop Antenna (A30015C). The green light flashes when we first apply power. When the green light is steady, the circuit has warmed up. The red light turns on when the spectrometer is in use. For a view of the same device without and enclosure, see A3008C. The A3008 is a LWDAQ device. The LWDAQ software's RFPM Instrument (radio frequency power meter) obtains RF power measurements from the A3008. The Spectrometer Tool gathers these power measurements together into a graph. The A3008 uses an eight-bit DAC to set the TUNE input of a MAX2624 VCO. For DAC values 0 to 255, the VCO output frequency increases from roughly 850 MHz to 1050 MHz. The A3008's RF input is amplified and passes into a mixer, where it is downshifted by the VCO frequency. The resulting IF is low-pass filtered with cut-off frequency 1.5 MHz. The power present at the output of the low-pass filter is proportional to the power present at the A3008's RF input in a 3-MHz wide frequency window centered upon the VCO frequency. Figure: RF Spectrometer (A3008D) Back Side. The coaxial cable brings the antenna connection to the spectrometer. The unused BNC socket is the local oscillator output, which we use to calibrate the spectrometer. Calibration constants for this particular spectrometer are on the lower right of the back wall. Each spectrometer's amplifiers and local oscillator are slightly different, but they are stable. We account for variation from one device to the next by means of calibration constants, which we list on the back wall of the A3008D enclosure. We enter these values into the Spectrometer Tool to obtain ±1 MHZ frequency measurement in the 900-930 MHz band and ±2 dB power measurements in the range −70 to −20 Bm. Table: Versions of the A3008. All versions of the A3008 suffer from a +0.2 MHz/°C shift in measured frequency with ambient temperature. This shift occurs as the VCO frequency changes by −0.2 MHz/°C. We must let the spectrometer warm up for a few minutes to allow it to reach equilibrium. The A3008 flashes its geen power light until the circuit has warmed up. The red light, meanwhile, turns on when the A3008B is in use. The A3008 is designed to measure the strenght of SCT signals, which is something commercially-available spectrometers are unable to do because of the intermittent and broad-band nature of the SCT transmission bursts. We use the A3008 to check the output power of our transmitters during quality control. We use the A3008 to check that no significant SCT power escapes our faraday enclosures. Another important use of the A3008 is to measure ambient interference in the 902-928 MHz band to determine whether the operation of an SCT system is possible within a room proposed for telemetry. Our faraday enclosures and multiple, independent antennas are designed to give us sufficient immunity to radio-frequency (RF) interference to permit the operation of our SCT system. But if we are close enough to a mobile phone base station, the system may still fail to provide robust reception. The A3008 will measure interference in your proposed recording room and determine the ambient interference power. The 902-928 MHz Industrial, Scientific, Medical (ISM) frequency band is recognized for unlicensed use in North America, South America, and the UK. In countries where the 902-928 MHz band is reserved for the exclusive use of license-holders, our faraday enclosures ensure that no significant RF power is radiated by our SCT system, thus making sure we do not violate local regulations. The regulations governing the 902-928 MHz band have evolved in the years since we first chose it for our SCT telemetry in 2005. The band is still recognised for unlicensed transmitters up to 1 W in North and South America. But in 2013, the FCC granted a private company a license to transmit up to 30 W in the USA. A 30-W transmitter less than 10 m from one of our recording systems will disrupt reception. But such proximity should be easy to avoid. Figure: United States Radio Frequency Allocation 2013. Compare to the allocation of 2006. The 902-928 MHz band was previously 915±13 MHz, now it is marked as only 915±0.13 MHz. In Europe, the UK still recognises the 902-928 MHz band for unlicensed transmitters up to 1 W, but they have granted mobile phone companies license to use the same band with base stations transmitting up to 3000 W effective radiated power. An SCT telemetry system directly in the path of such a base station transmission will be disrupted at ranges less than 100 m. Mobile base stations tend to be over twenty meters above the ground, mounted on towers or the sides of tall buildings. The upper floors of neighboring buildings receive the most power from such base stations. Near base stations, lower floors are better than upper floors, and basements are best. The A3008 consists of a local oscillator (LO), a radio-frequency input (RF), a mixer, a 1.6-MHz low-pass filter, and several intermediate frequency (IF) amplifiers. We obtain the IF by mixing the RF and LO, so that the IF frequency is the difference between the LO and RF. We vary the LO frequency by writing a value 0-255 to the circuit's firmware. We pass the IF through the 1.6-MHz low-pass filter, and so retain only the signal in RF that is in a 3-MHz window centered on the LO frequency. We select one of four amplifications of the IF signal for return to the LWDAQ driver. By digitizing these IF signals, we can determine the power over a range −70 to −20 dBm. S3008A_1: The LVDS receiver for connection to the LWDAQ, the programmable logic chip, and 32.768 kH reference oscillator, U6. S3008A_2: The antenna amplifier, mixer, low-pass filter, IF amplifiers, gain selector, local oscillator, local oscillator control, calibration oscillator, and calibration frequency SAW filters. S3008B_1: The LVDS receiver for connection to the LWDAQ, the programmable logic chip, and 32.768 kH reference oscillator, indicator LEDs, and U6. S3008B_2: The antenna amplifier, mixer, low-pass filter, IF amplifiers, gain selector, local oscillator, local oscillator control, calibration splitter and calibration socket. A3008C.ods: Bill of materials for A3008C/D. P3008A02: Firmware source code for A3008A/B. P3008A03: Firmware source code for A3008C/D. A301601A: Gerber files for PCB used in A3008B. The A3008 amplifies its RF input by 18 dB and feeds it into a frequency mixer for downshifting. The mixer's LO signal comes from a MAX2624, whose output frequency is set by its TUNE input, as shown in the figure below. The IF output from the mixer passes through a 1.6 MHz low-pass filter. The filtered IF signal is the downshifted version of the RF frequencies within 1.6 MHz of the LO frequency. Example: If the LO frequency is 950 MHz, then any RF signal whose frequency is in the range 950±1.6 MHz will emerge from the mixer as an IF signal in with frequency in the range ±1.6 MHz, and so pass through the IF filter. The A3008 measures RF power in a 3.2-MHz band centered upon its LO frequency. We set the LO frequency using U11, and eight-bit DAC. The DAC can vary the LO chip's TUNE input from 0 V to 2.8 V in steps of 11 mV. The RFPM Instrument allows you to specify the DAC value with its dac_value parameter. When dac_value is 0, the TUNE input will be 0 V. When dac_value is 255, TUNE will be 2.8 V.
Figure: Typical Local Oscillator Frequency vs. DAC Output Voltage (from the MAX2624 data sheet). Because each step is 11 mV, and the slope of frequency with tuning voltage is 75 MHz/V, we expect the frequency to increase by ≈ 0.8 MHz per count. We note also the −0.2 MHz/°C change in oscillator frequency, which gives an apparent +0.2 MHz/°C change in the frequency of an external power source. Firmware P3008A01.abl for the A3008A suffers from calibration drift as we take continuous spectra. The VCO warms up as you we it, but cools down when we don't. Firmware version P3008A02.abl for the A3008B solves this problem by leaving the VCO on all the time. After a five-minute warm-up period, the A3008 is stable. The filtered IF signal is called IF1 in the schematic. The A3008 amplifies IF1 by ×11 to create IF2, and then amplifies IF2 by 11 to create IF3. The A3008 allows you to select any one of these three IF signals, and also a 0-V reference. The RFPM records all four of these signals using the LWDAQ driver's 8-bit ADC. Each ADC sample takes a minimum of 500 ns. If you set daq_delay_ticks to 0 in the RFPM, the ADC samples will be spaced by 500 ns, so the IF signals get sampled at 2 MSPS. We decrease the sampling frequency by adding 125 ns "delay ticks" to the sampling steps. The daq_delay_ticks parameter is the number of 125-ns delays you would like added to each 500-ns ADC sample. The daq_num_samples parameter tells the RFPM how many samples to take of each IF signal. We obtained most of the graphs below with 20 delay ticks and 10,000 samples. The sample period is 3 μs, the sample frequency is 333 kHz, the time per display division is 3 ms, and the total observed interval is 30 ms. The RFPM plots all IF signals that do not exceed the dynamic range of its display (this makes sure we don't obscure a useful trace with a large, saturating IF3 signal). It returns the peak-to-peak voltage it obtains from each of its four IF channels. The Spectrometer Tool translates these peak-to-peak voltages into RF power in decibels, and plots the power in its graph window. The spectrometer provides its own help with its Help button. Plug the A3008 into the LWDAQ. On the A3008B, the green LED should start flashing. If it doesn't, unplug the A3008B and plug it in again. The green LED is the READY indicator. It flashes for a few minutes, after which time the A3008B has warmed up, and it shines continuously. The A3008B does not measure the temperature of it's on-board VCO (voltage-controlled oscillator). All it does to generate the warm-up period is measure a time interval from power-up. Even a short interruption of power will start the READY light flashing again. If we use the A3008 before it's warm-up period of roughly four minutes has passed, its frequency calibration may be off by up to 4 MHz. Other than this frequency error, the A3008 will work perfectly well. For a plot showing how the A3008B's on-board oscillator frequency varies during warm-up, see below. Open the RFPM instrument in your LWDAQ software. Set it up to acquire from your A3008. You will need to set the daq_ip_addr and the daq_driver_socket. Press Acquire. You should see waveforms on the screen, and with each acquisition, four numbers appearing in the text window, as shown below. Whenever you press Acquire, you should see the yellow ACTIVE light on the A3008B flash. Figure: RFPM Instrument on MacOS. The plot shows a subcutaneous transmitter transmission, which lasts for roughly 7 μs. The RFPM Instrument provides three types of power measurement: average or maximum. When you set analysis_enable to 1, the result string contains the range over which each trace varied during the its measurement period. The range is the maximum value minus the minimum value. With analysis_enable set to 2, the result is the standard deviation of each trace. The former gives us peak-to-peak voltage, the latter is rms voltage. If the RFPM sees a sinusoidal waveform, the peak-to-peak voltage will be 2.8 times greater than the rms voltage. The dac_value sets the A3008's LO (local oscillator) frequency. The A3008B mixes the LO with the RF input to produce an IF frequency that we low-pass filter with a cut-off of 1.6 MHz. The ±1.6 MHz pass-band of the low-pass filter gives the A3008 a 3.2-MHz pass-band centered upon the LO frequency. What you see in the display of the RFPM is whatever signal is present within this 3.2-MHz passband. The RFPM obtains three traces from the A3008, each with higher gain than the last. It displays only the traces that are not saturated in intensity. The following table lists the four traces. The gains we give in the above table are voltage gains with respect to IF1 in the schematic). Table: RFPM Signal Traces and Gains. The daq_num_samples parameter sets the number of samples of each signal (gains 0, 1, 11, and 121) the RFPM analyzes and displays. With daq_delay_ticks = 0, the samples will be recorded with a period 500 ns (2 MSPS). With daq_delay_ticks = 1, the samples will be recorded with period 625 ns, and so on, with the period increasing by 125 ns for each increment of daq_delay_ticks. The Spectrometer Tool uses the RFPM Instrument to measure power at a range of frequencies. Before you use the Spectrometer Tool, configure the RFPM Instrument to read values from your Spectrometer (A3008) device. The power is displayed in dBm. The frequency range is defined by count_min and count_max. These are integers in the range 0-255, corresponding to the eight-bit parameter dac_dac_value. The power range is from power_min to power_max. You can adjust these limits with the Configure button. The Spectrometer draws vertical lines upon the plot to mark the frequencies listed in f_lines. We specify these frequencies in megahertz. Each spectrometer has a slightly different relationship between its DAC control number and its LO frequency. In f_ref we enter a reference frequency in megahertz and in dac_ref we enter the DAC value that causes our spectrometer device to generate this frequency. In f_slope we enter the slope of frequency with DAC value in megahertz per count. In p_calib we enter a power offset to correct the raw power measurement from the Spectrometer hardware. In the calibration section below, you will find values for these three calibration constants for your A3008 circuit. Figure: Spectrometer Tool on MacOS. The red trace shows a 910.3 MHz oscillator output of power −24.6 dBm. The top of the plot is −20 dBm and each horizontal graduation is 10 dBm. 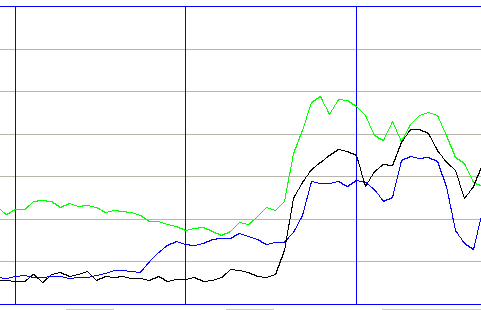 The green and blue traces are the same 910.3 MHz, but −44.6 dBm and − 54.6 dBm. These three traces we recroded with the "Average" measurement type. The magenta trace is a subcutaneous transmitter spectrum, with peak power −25.1 dBm, which we recorded with the "SCT" measurement type. The yellow trace is the same transmitter, but with peak power −35.1 dBm. Open the Spectrometer Tool from the Tools menu. Press Scan. Assuming you have set up the RFPM Instrument correctly, the spectrometer will begin to plot a spectrum. Press Repeat and it will monitor one frequency. To plot the spectrometers noise, select the Average measurement type and unplug the A3008's antenna. Noise is generated by the A3008 itself, but also invades the A3008 amplifier from outside. You may see peaks in your spectrum that correspond to local interference. In the plot above, we see peaks at 926 MHz that are local interference. With the Save and Load buttons, you can save and load spectra as text files. The raw Spectrometer data we link to in the sections below is data we saved to disk in this way. You can download it, look at it with a text viewer, and read it into your own Spectrometer to see the graphs. The Spectrometer plots data in its active graph. You can clear the active graph with the Clear button, and all graphs with the Clear All button. Each graph has its own color, and each graph is named after a letter. When you obtain a new point in a graph that duplicates a previously-existing step value in the same graph, the Spectrometer deletes the previous graph point. You can turn on and off the cursor with the cursor check box. The horizontal grid lines you can adjust with step_min, step_max, and step_div. By default, the Spectrometer measures SCT power, but you can instruct it to measure average or peak power with the Measurement option menu. The SCT power measurement differs slightly from the peak power measurement in that the SCT spectrum is spread out, so the 3-MHz window of the A3008 does not detect all its power. We add roughly 2 dB to the peak power measurement to obtain the SCT power measurement. You can add frequency lines with the "Frequency Lines" entry box. You specify each line with a single frequency in megahertz. [31-MAY-07] We took the LO output from our A3008B and fed it into the RF input of a mixer. We used our 868-MHz SAW Oscillator (A3014SO) as a source of LO. We measured the period of the IF on our oscilloscope. We set plugged power into the A3008B, set its frequency-control DAC to 10 counts immediately, and started measuring the A3008B's VCO frequency. We obtained the plot below. Figure: VCO Frequency vs. Time After Power-Up. We set the frequency DAC to 10 immediately after power-up. We concluded from this plot that a four-minute warm-up period would be adequate for 1-MHz calibration accuracy. According to this plot, the temperature coefficient of the MAX2624 frequency is around −30 MHz / 125°C = −0.25 MHz/°C. A 4°C change in room temperature causes a 1 MHz error. [06-MAY-16] Here are the calibration constants that accompany existing A3008C/D circuits. We enter some of these calibration constants into the Spectrometer Tool to make sure frequency and power are interpretect correctly. Table: Calibration Constants for Spectrometer Circuits. Ambient temperature is 20°C. [29-APR-16] The A3008B provides a socket from which you can extract a fraction of the LO power, and so calibrate the LO with respect to DAC output. For this calibration, you would need an accurate local oscillator and a mixer. We use the ZAD-11 mixer and our 910.3-MHz SAW Oscillator (A3016SO). We mix the Spectrometer's LO output with the 910.3 MHz and measure the IF frequency. By increasing dac_dac_value, we can determine when the IF is negative or positive. We determint daq_dac_count that gives us LO closest to 915 MHz, and this value acts as the center-frequency calibration for the Spectrometer Tool, which we call dac_ref. Figure: LO Frequency vs. dac_dac_value. We set daq_dac_count to thirty counts above and below dac_ref and measure the change in LO frequency. Thus we obtain the slope of frequency with the count, which we call f_slope. We apply a subcutaneous transmitter signal of known power to the antenna input and measure the peak power of its spectrum. We adjust p_calib in the Spectromater instrument until the peak power measurement equals the subcutaneous transmitter burst power output. The LO output power of the A3008B is constant to ±0.5 dB from 875-1050 MHz, but varies by ±3 dB from one circuit to the next. We tune the LO of Q0158 until it is close to 911 MHz and mix the LO with the 910.3 MHz. We obtain an IF of 750±75 kHz. The fluctuations in frequency are due to noise on the input of the VCO that generates the LO on the Spectrometer circuit. These fluctuations are beneficial to the spectrometer because they prevent loss of power measurement when the LO and RF signals have the same frequency. When the IF is below 100 kHz, it is attenuated by the high-pass filters in the IF amplifier. Because the LO fluctuates by 150 MHz, we are certain to obtain a power measurement even when the average RF frequency is equal to the average LO frequency. We take our 910-MHz SAW Oscillator (A3014SO) and apply its output to an un-calibrated Spectrometer (A3008B) and average power with an early version of the Spectrometer Tool. We use attenuators to vary the power we deliver to the A3008 and check the delivered power with our vector voltmeter. Figure: Spectrometer Power versus Input Power at 910 MHz. For inputs greater than −20 dBm, the spectrometer fails, giving a much lower power reading. The slope of the linear part of the graph is 1.00 dB/dBm. The A3008 fails for constant-frequency inputs higher than −20 dB, because the VCO that generates the LO locks its frequency to the RF input and the IF is too low to pass through the IF amplifier's high-pass filters. [06-MAY-16] We leave four A3008Ds running for five days, and re-calibrate them. Spectrometer Q0158's frequency calibration remains 57, but power calibration increases from 3.2 dB to 4.0 dB, and LO output power increases from 2.8 dBm to 3.7 dBm. Spectrometer Q0159's frequency calibration remains 50, but power calibration rises from 2.2 dB to 2.6 dB and LO power drops from 3.2 dBm to 1.6 dBm. Spectrometer R0201's frequency calibration remains 58, but power calibration increases from −1.2 dB to +0.6 dB, and LO power drops from 6.3 dBm to 4.5 dBm. Spectrometer R0202's frequency calibration increases from 57 to 58, its power calibration increases from −1.2 dB to 0.6 dB, and its LO power output drops from +5.3 dBm to 4.3 dBm. The power calibration of our spectrometer circuits we obtain with a reference oscillator applied to the input. But the main purpose of the A3008 is to measure the power of subcutaneous transmitters. We have a Subcutaneous Transmitter (A3028) with a BNC socket soldered onto its RF output. We pass through a 6-dB attenuator and mix with 869.4 MHz in a ZAD-11. We trigger our scope from TP1 on the transmitter circuit. The IF amplitude is 37 mVpp. We set our Q0158 spectrometer to 915 MHz LO and measure LO power 4.0 dBm. We pass through a 6-dB attenuator and mix with 869.4 MHz. The IF amplitude is 142 mVpp. Thus the power delivered by the transmitter to its BNC connector is −7.7 dBm. We pass the transmitter signal through a 30-dB attenuator and apply to the Q0158 input. We adjust the Spectrometer's sct_to_dBm value to 1.0 dB, and the SCT peak power in the Spectrometer is −37.7 dBm. And so we obtain a value for sct_to_dBm, which takes a peak power measurement and converts it to transmitter power at the center frequency of the transmit signal. [31-MAY-07] The A3008A provided a crude and ultimately unhelpful means of calibrating its own frequency response. The A3008A and A3008B differ in the following respects. The A3008A attempts an internal calibration with SAW filters as frequency references. This internal calibration did not work well, so the A3008B provides a LO frequency output. We calibrate the LO frequency with respect to the A3008's frequency-selection counter with external mixers and an oscilloscope. The A3008B provides two indicator lamps: READY and ACTIVE. The READY light flashes after power-up until the warm-up period has passed. The ACTIVE light turns on when the LWDAQ reads voltages from the A3008B. 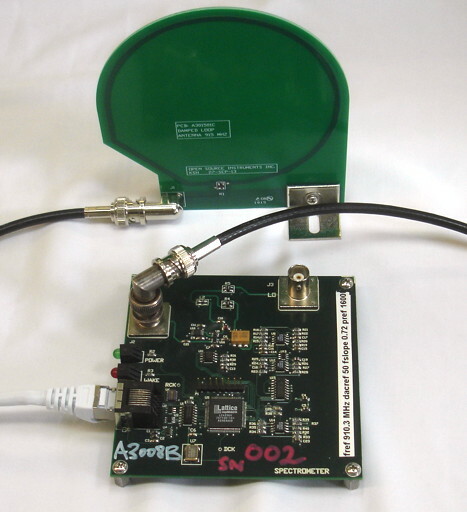 The A3008B provides a BNC connection for its antenna, so we can use it with the Antenna (A3015), or we can connect the input to a calibrated source of RF power. The A3008B provides a BNC connector for its LO (local oscillator) frequency. This allows us to calibrate the LO frequency with respect to the A3008B's DAC value. There is a second VCO (U16) on the A3008A, which we call the calibration oscillator (CO). We use the CO to excite three SAW filters. The outputs of three filters are weakly coupled into the A3008A's RF input. We sweep the CO frequency from 875 MHz to 1050 MHz over the course of 30 ms, and simultaneously record the four IF signals (0-V reference, ×1, ×11, and ×121). At the same time, we record the IF output. When the CO frequency passes through the LO frequency, we always get a pulse in the IF signal, like this, but the pulse gets larger when the LO frequency lies within the passband of one of the three SAW filters. The three SAW filters specified in the schematic have passbands 869±1 MHz, 915±12 MHz, and 947.5±12.5 MHz. The first one is not much use, because it is outside the range of the LO frequency. The second and third filters turn out to overlap in most cases, so they don't give us two discrete calibration bands. In our two prototype A3008s, we omitted the coupling for the first two filters, and just left the 947.5±12.5 MHz filter. The auto-calibration is not helpful because the pass-band of the SAW filters can be much wider than their minimum specification, an is not centered to better than ±5 MHz. Because of the failure of the self-calibration, we removed it from the A3008A circuit and replaced it with an output socket for the LO frequency. We removed the calibration option from the LWDAQ software's RFPM instrument. [01-MAR-2006] Below is a detail from the low-frequency end of our outside spectrum. Figure: Spectrum Outdoors in Waltham (Close-Up). We have a peak in the blue curve at 900 MHz and 1000 MHz. We have orange vertical markers at 930 MHz, 950 MHz, and 970 MHz. To match the outside spectrum with the blue peaks and the orange vertical markers, we must shift it by 7 frequency steps to the right. We obtain the following table of interference power in various frequency bands. We quote power relative to the bottom of our spectral graphs. Table: Interference Outside our Laboratory. We quote the RF power density in dB above the bottom of our graphs. The +30 dB power at 930 MHz explains why we could not operate A3006 transmitters outside at any range. The weakness of the A3006 is that it does not transmit power in the A3005 receiver pass band during zero bits, so that any ambient power above about +15 dB will saturate it during zero transmissions, and so give false zeros. With the new A3009 transmitters, and modified A3005 receivers, we will be transmitting zeros and ones within the receiver pass band, so we expect to be able to dominate the interference by bringing the transmitter close enough to the receiver. Below we see the spectrum recorded by the A3008 for an active A3006 Subcutaneous Transmitter at ranges 60 cm and 600 cm in the basement lab. Note that the spectrum extends up to 1050 MHz. This may be a failure in the A3008's ability to reject frequencies outside its current selected band, or it may be that the A3006's spectrum really does extend up into the 1050 MHz band. We have no way at the moment to distinguish between the two possibilities. Note that the ratio of the peak power at 950 MHz is roughly 20 dB (×100), which is what we expect with an increase in range of ×10. Figure: Power Spectrum for Transmitter At Range 60 cm and 600 cm. For reliable data recording by a dual receiver, we believe the SCT power must be at least +10 dB greater than the interference. This minimum power sets the maximum range at which the SCT can operate. With +10 dB of interference, the SCT power must be >20 dB, which is the case for ranges less than 6 m. With +30 dB of interference, the SCT power must be >40 dB, which it is at ranges less than 60 cm. When we step inside the doorway, the SCT ranges improve because of the shielding provided by the building. Table: Interference Just Inside Our Laboratory. And finally, the interference in our basement laboratory, ignoring that coming from the SCT dual receivers themselves. Table: Interference In Our Laboratory. We provide the above table as a reference, because we have observed the reception at range 6 m to be stable with a dual receiver in our laboratory. It is clear that here in Waltham, operating in the 1000-1050 MHz would be perfect. A SAW filter with 30 MHz bandwidth and center frequency 1030 MHz is available from Golledge. Below is a fragment of a chart giving the United States radio frequency allocations. 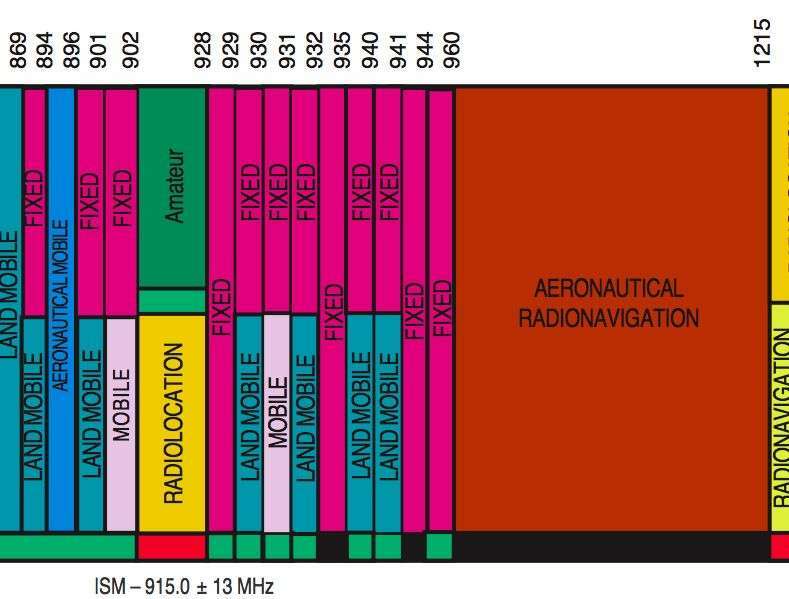 As you can see, the band 960 MHz to 1215 MHz has been reserved for Aeronautical Navigation. Transmitting 300 μW in this band within the confines of a laboratory would have no effect upon aeronautical navigation. Within five meters of the laboratory's external walls, the Subcutaneous Transmitter's signal will be beneath thermal noise. We could ship transmitters in metal boxes, or wrapped in foil. If the transmitter turned on by impact or magnetic field, no measurable power would escape the wrapping. We would prefer, however, to operate in the ISM band, which is free for anyone to use. The ISM band appears to be the 26-MHz range between the peaks seen in the outside spectrum. We cannot be exactly sure of the frequencies to within a MHz, but we are confident to within 5 MHz. Certainly, it's worth trying the ISM band here in the United States. [02-MAR-06] A few weeks ago, we recorded the following spectra in and outside our laboratory at 8 pm. The outside temperature was -2 °C. We recorded the red spectrum just inside the doors, where it was 15 °C. We see the same spectrum as outside, but attenuated by 10 dB, and shifted up by five frequency steps, or roughly 3.5 MHz. The blue trace we obtained ten minutes later in the basement laboratory, with no SCTs turned on, but the SCT dual receiver with their 1-GHz local oscillators turned on. The temperature in the laboratory was 19 C. We see signs of the same features at around step 60 as we saw outside, but shifted up by seven frequency steps, or roughly 5 MHz. 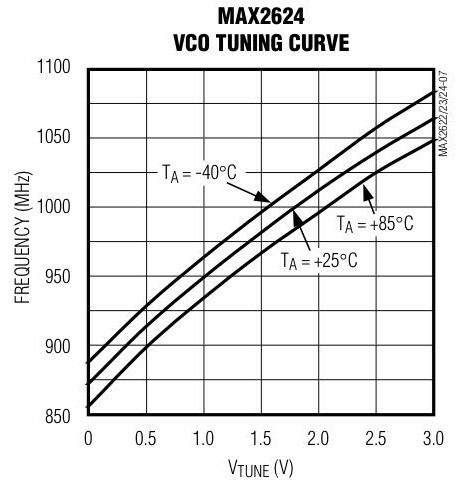 The VCO tuning curve above shows a 25 MHz drop in VCO frequency with a 125 °C rise in temperature. That's −0.2 MHz/°C. With our 21 °C increase in temperature from outside to inside, we expect our LO frequency to decrease by roughly 4 MHz. We observe roughly 5 MHz. We took another spectrum with our SCT dual receivers unplugged. The two peaks at 1 GHz (step 163) and 900 MHz (step 34) disappeared. [10-MAR-06] We obtained the following spectra using our Modulating Transmitter (A3001A). We drive its TUNE input with a square wave that switches from 1.1 V to 1.4 V at frequencies 200 kHz, 2 MHz, 5 MHz, and 10 MHz. Figure: Frequency Modulation Spectra. Our RF signal source is switching between roughly 940 MHz and 960 MHz, at various frequencies. We see the Bessel function curves predicted by theory when the modulation bandwidth is comparable to the separation of the two frequencies. In our case, the two frequencies are separated by 30 MHz, and we start to see the Bessel function at a modulation frequency of 5 MHz. [31-MAR-06] It appears that the ISM band is respected in the UK also, as shown here. They describe the ISM band as "Fixed, Amateur". Figure: RF Power Spectra in the Institute of Neurology, London 30-MAR-06. The vertical lines mark 20-MHz boundaries, starting with 880 MHz on the left edge of the graph. The horizontal lines mark relative power density in +10 dB increments, with −85 dB along the bottom. One division higher means ten times the power density. These are the spectra from Matthew Walker's laboratory and recording room, recorded by Matthew Walker himself. The recording room is where the rats with implants will live. The laboratory is outside his office. There is broad interference across the entire frequency band in the laboratory. When someone turns their mobile phone on, the spectrum rises by 10 dB, and becomes erratic. We suspect that we are seeing the mobile phone's spurious power emissions, which may be transient. The Spectrometer measures the maximum received power in its measurement interval, not the average power. When we look at the two laboratory spectra without local mobile phone interference, we see what looks like the sum of many mobile phones transmitting in the same broad way, in neighboring buildings. In the recording room, we have three spectra from three different locations. They show residual power in the Fixed Mobile 5.317A band, 942 MHz - 960 MHz. From the location of this band, we think we can say that the vertical black lines in our plot lie upon 20-MHz boundaries. If that's the case, then the peaks to the left is at 930 MHz, in another fixed mobile band. Below that we have several power peaks in the range 910 MHz to 925 MHz. The power in these peaks is approximately equal to the power we record from an A3006 SCT at range 6 m. At range 3 m, an A3009 SCT would dominate the interference. We should be able to operate in the ISM band in Matthew's recording room at ranges less than 3 m.
Figure: Spectrum and RFPM Display for Interference in France Outside Geneva. Green trace is with no SCTs plugged in, red trace with one plugged in at range 1 m. The blue lines mark 900, 910, 920, and 930 MHz. The above figure shows interference power peaking about 10 dB higher than our signal power at 1 m, even in a favorable orientation. The 902-928 MHz ISM band must be in use for some unlicensed devices more powerful than our own, or France does not respect the band. The operating range of the transmitter in this interference is only a 10 cm. [31-MAY-07] These following spectra are taken with the new A3008B after we calibrated its ISM-band frequencies to 1-MHz accuracy, as described above. Figure: Calibrated Power Spectra From Various Sources. The red trace is with the RF input terminated with 50 Ω. The green trace is with a Loop Antenna (A3015A) connected to RF with a 96" coaxial cable, but all of our own sources of ISM-band power off. We leave the Loop Antenna connected for the rest of the spectra. The blue trace is with our 910-MHz +12-dBm SAW Oscillator (A3014SO) turned on, with a 75-mm wire as an antenna, place 50-cm from the spectrometer antenna. You can see the large bump corresponding to the 910-MHz, and many other bumps. For the orange trace we insert a 20-dB attenuator in the antenna line. For the yellow trace, we turn off the 910 MHz and turn on a Subcutaneous Transmitter (A3013A) and place it 50-cm from the Spectrometer antenna. For the purple trace, we move this same transmitter to a range of 5 m.
[09-APR-09] Subsequent work on the spectrometer reveals that its noise floor is at −80 dBm. This floor is visible on the right side of the plot above: its is the green straight line. The interference power rises to a peak of −51 dBm, with another broad peak at −60 dBm. The spectrometer has a measurement bandwidth of 3 MHz, so we can calculate the total interference power in the 900−930 MHz band by dividing the band into ten 3-MHz sections and adding the power together. We arrive at roughly −48 dBm total interference in the band. In a separate experiment, we measured the interference power in our basement laboratory in Boston with our Demodulating Receiver (A3017), and found it to be −68 dBm. Our operating range in there is 100 cm. With 20 dB more interference, our operating range will be ten times less, or 10 cm. Figure: Spectrum at ION on 15-APR-09. Blue lines are 900 MHz, 915 MHz, and 930 MHz, marking the Data Receiver (A3018) passband. [15-APR-09] Today reception was good in the ION animal laboratory. The interference spectrum, taken by Pishan with A3008B number 001, shows less power than the one Matthew obtained in 2006. [22-JAN-10] We obtained the following spectra in the Children's Hospital Boston basement, in the Operating Room (OR) and the Animal Room (AR). We also show spectra obtained the day before outside in Waltham. Figure: Spectrum at CHB Basement. We show peak and average power. [25-JAN-10] We obtained the following spectra at the OSI office on Moody Street, Waltham. Figure: Spectrum in Moody Street Office. We shoe peak and average power of interference, and peak power to obtain spectrum of a transmitter at 30 cm. Reception from the transmitter while hand-held and moving at up to 50 cm range was 60%. [20-SEP-13] We receive the following spectrum from her animal laboratory in Edinburgh. Figure: Spectrum in Edinburgh. The green trace is with a transmitter near the spectrometer antenna, the red is background. Above 927 MHz, interference power is -45 dBm in each 3-MHz window examined by the spectrometer. Iris is using an A3015B antenna, which contains a 3-dB attenuator, so actual power is around -42 dBm. In 927-930 MHz, where we are sensitive, there is -42 dBm of power. This is great enough to require a faraday enclosure for reliable reception with only one receiving antenna. [11-NOV-13] We take our first spectrum at our new OSI office on Pratt Ave. Figure: Spectrum in Pratt Avenue Office. The green trace is peak power, red trace average power. The peak at 926 MHz is −46 dBm. Our Moody Street office has a peak at 926 MHz also, but it is only −60 dBm. Reception in the Bratt Avenue office is not robust even at range 20 cm. [06-MAR-14] We take a spectrum at MRC Harwell, reception building. We equip the A3008B with an A3015C damped loop antenna. Figure: Spectrum at MRC Harwell, Reception Building. Red: peak power of transmitter on the antenna. Green: average power without transmitter, horizontal antenna. Blue: average power without transmitter, vertical antenna. There appears to be no interference in the 900-930 MHz band. We obtain robust reception with one antenna up to 50 cm. [25-MAR-16] We take the following spectra in the OSI basement office in Waltham, MA. Figure: Spectrum in OSI Office. Blue vertical lines are 900, 915, and 930 MHz. Vertical divisions 10 dB received power, with −100 dBm at bottom. Red: background in FE2F faraday enclosure. Green: background on bench top. Blue: three A3028E transmitters in 200 ml of 60°C water in FE2F. Yellow: a second set of three A3028E transmitters in 200 ml of 30°C water in FE2F. Brown: the second set of three A3028E transmitters in air at 20°C in FE2F. Isolation provided by the FE2F is around 26 dB. Interference outside the faraday enclosure is centered on 926 MHz and −48 dBm. Previous measurements show reception of up to −45 dBm in other office locations. Other than this peak, there is no measurable interference. The same three transmitters emit roughly 6 dB more power when immersed in 200 ml of water. From the above graphs, the temperature coefficient of the A3028E center frequency is −0.2 MHz/°C, which agrees with the data sheet. [30-JAN-17] Spectra from Philipps University, Marburg, showing RF power inside and outside faraday enclosures with subcutaneous transmitters running within the enclosures. Figure: Spetra Obtained at Philipps University in Marburg. Power −90 to −40 dBm. We see no sign of significant interference within the 900-930 MHz band. [27-JUL-17] We receive the following spectra Edinburgh University, where they recently moved their SCT recording system from one room to another on the top floor of their CCNS building. Room A is the original room, from which we obtained spectra in 2013. Figure: Spectra on Top Floor of CCNS, Edinburgh. Power −90 to −20 dBm. Frequency lines are 900, 915, and 930 MHz. Green trace outside of enclosure in corner room. Blue trace inside enclosure in corner room. Black trace outside of enclosure in edge room. Peak interference power in the Corner Room is −41 dBm (80 nW) outside the Faraday enclosure and −61 dBm (800 pW) inside. In the edge room, meanwhile, we have peak interference in 900-930 MHz of −54 dBm (4 nW). The spectrometer measures the power in a 3-MHz band, while the interferene we see above spans 6 MHz at the top of the 900-930 MHz range our SCT receivers are sensitive to. Thus we estimate the total interference power is equivalent to a single frequency of 160 nW outside the enclosure in the Corner Room, 1.6 nW inside the enclosure in the Corner Room, and 8 nW outside in the Edge Room. Reception from implanted SCTs is reliable only when interference outside the enclosure is less than 40 nW. Thus we expect reception to be unreliable in the Corner Room, and indeed it is: for 30% of the time, reception is less than 80%. The original recording room was the Edge Room, with one outer wall on the top floor of the CCNS building. 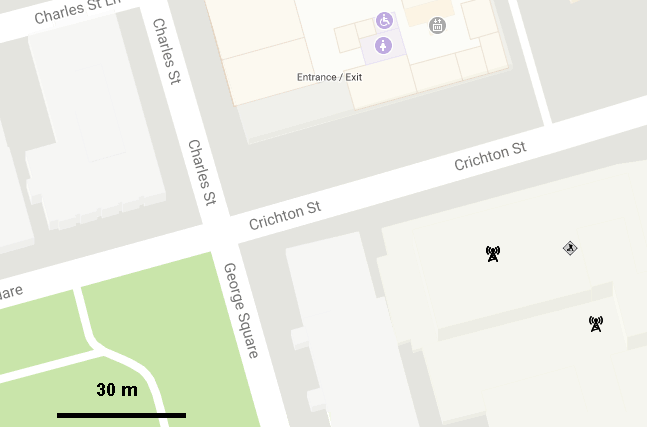 The new room is the Corner Room, directly opposite another taller building with three mobile phone base stations. According to a map of the local base stations, the nearest is 60 m away from the Corner Room, with only the outer building wall as an attenuator. The Edge Room is 80 m away with three attenuating walls. The interference power we see in all three traces above correspond to the 925-960 MHz downlink band of the 900 MHz GSM network. [08-MAR-16] We consider the possible use of power received from a subcutaneous transmitter as an indication of its location with respect to the receiving antenna. We measure received power versus position for a 50-mm bent transmit antenna in water and both 100-mm and 10-mm loop antennas in air. Figure: Received Power versus Position for 50-mm Bent Transmit Antenna in Water, 0 cm or 10 cm Above Table (0/10), with 10-mm or 100-mm Receiving Loop (S/L) on Table, and in Two Directions (X/Y). [11-MAR-16] The 100-mm loop antenna can receive less power as the transmitter comes nearer. The tiny loop antenna receives more power at shorter ranges, but far less power in absolute terms for ranges 5 cm and up. We make a 15-mm long quarter-wave antenna. The permittivity of water is 80 times higher than that of air, so the resonant length of the quarter-wave antenna in water is roughly 9 times shorter than the 80-mm it is in air. So we expect resonance at 9 mm in water. We are starting with 15 mm. 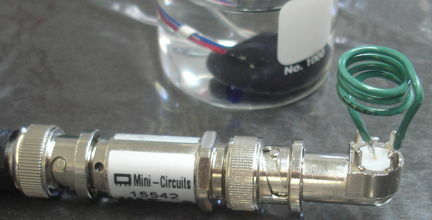 Figure: A 15-mm Quarter-Wave Antenna in Water. In air, this antenna picks up −61 dBm from a nearby transmitter. 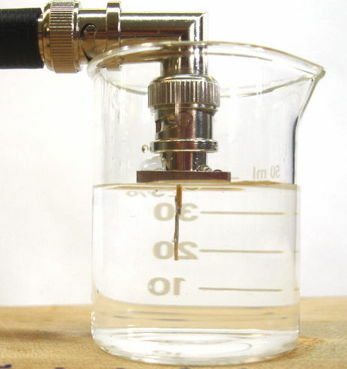 We pour water into the beaker as shown above, and received power increases to −49 dBm. We clip the antenna back to 9 mm and we get −54 dBm. We increase to 20 mm and get −52 dBm. We cut back to 15 mm and get −48 dB. See here for measurements of the ideal length of a transmit antenna in water. We measure received power for the 15-mm quarter-wave antenna in water and in air. Figure: Received Power versus Position for 50-mm Bent Transmit Antenna in Air, Receive Antenna 15-mm Loop or Straight (S/L), in Air or Water (A/W), with Ground Plane (G). The straight antenna in water acts like a much larger antenn: power can decrease as the transmitter comes near. We make a 15-mm loop antenna and put it on a right-angle BNC plug, so that it rests upon our wood table. This antenna picks up −27 dBm when the transmitter is right over the antenna at a range of a few millimeters. Power greater than −45 occurs if and only if the transmitter is within a few centimeters of the antenna. We raise the 15-mm diameter loop 20-mm off our table and lay a conducting sheet on the table to act as a ground plane. We move our transmitter along the same path as before, but 60-mm above the ground plane. Now we pick up less than −60 dBm everywhere, although we do get more power the closer the transmitter is to the antenna. We move the transmitter around on a stick and find that, almost all the time, power greater than −50 dBm, regardless of orientation and position, indicates the transmitter is within 5 cm of the antenna, and power less than −60 dBm almost always indicates that the transmitter is farther than 10 cm from the antenna. [15-MAR-16] We make an unterminated 10-turn coil of solid wire 20 mm in diameter and support it 20 mm above a ground plane. Along a platform 60 mm above the ground plane, we move an A3028B mouse-sized transmitter with 30-mm antenna in a 30 ml of water with its antenna loop roughly 20° to the horizontal. We move a distance 30 cm along the platform for various orientations of the transmitter cup about the vertical, so simulate an animal turning around as it moves about a cage. Figure: Received Power versus Position for 30-mm Bent Transmit Antenna in Water. Moving 60 mm above a ground plane, 40 mm above a 10-turn 20-mm diameter coil antenna. Four orientations of the transmitter about vertical axis. The coil has rotational symmetry about the vertical axis, but the transmitter does not, hence the variation in reception with transmitter orientation. But we do not expect these graphs to vary as we change the line of motion with respect to the coil. We are usually able to detect the presence of the transmitter 10 cm away. Power at range 0 cm is always greater than power at range 5 cm. An array of such coils on a 10-cm grid could provide location tracking with accuracy ±3 cm, and resolution ±1 cm. [22-MAR-16] We wind a 3.5-turn 13-mm diameter loop of hookup wire and solder it to a right-angle BNC plug. According to an inductance calculator, this coil should have indutance roughly 160 nH. We combine the antenna with a 3-dB, 50-Ω attenuator, after noting that the power delivered by the antenna increases by 10 dB when we add the attenuator. We place the center of the coil 30 mm above a ground plane made of conducting graphite sheet. Figure: Damped Small Loop Antenna. Black sheet is conducting. In the background is a rat transmitter in a 30-ml of water. We move the transmitter as before, 6 cm above the ground plane, which is 3 cm above the coil, from position (−15 cm, 0 cm) to (+15 cm, 0 cm) in four orientations. We measure received power every centimeter. Figure: Received Power versus Position for 3.5-Turn 10-mm Diameter Coil for Receive and 50-mm Bent Antenna in Water for Transmit. Moving 30 mm above the center of the coil, 60 mm above ground plane. Four orientations of the transmitter about vertical axis. We place the transmitter at the same height, but in five different locations with respect to the fixed receiving coil antenna. At each position, we rotate by 360° in 22.5° steps and record received power. Figure: Received Power versus Rotation for 3.5-Turn 10-mm Diameter Receive Coil and 50-mm Bent Transmit Antenna in Water. Always 30 mm above the plane of the center of the coil, 60 mm above ground plane. Each plot is one position in centimeters in x-y coordinates. We see that our receiving coil provides at least 5 dB more power for a transmitter directly above the coil than for a transmitter 5 cm away from the coil, for all orientations and directions. Suppose we have an array of five receiving coils arranged at positions (0,0), (-5,0), (5,0), (0,5), (0,-5). We have a transmitter directly above the central receiving coil. We measure power received by all five coils. We subtract a threshold of −80 dBm from all our power measurements, this being the power we get when we turn off the transmitter, and so obtain the power above minium for each antenna. We take a weighted centroid of this logarithmic power measurement for each of our sixteen orientations, and so obtain a measurement of position that simulates a transmitter rotating above a receive coil with an array of five coils spaced on a 5-cm grid. The plots below show how the x and y location varies with rotation. Figure: Calculated Position of Transmitter with Orientation. We use the data of our previous plot to calculate how an array of five receiving coils would yield position with a transmitter rotating by 360° over the center receiving coil. Power threshold −80 dBm, using all five coil measurements. Coils far from the transmitter will have a large effect upon measured position, even if the power they detect is barely higher then our noise level. We introduce into our weighted centroid calculation a power threshold. If a coil power is greater than the threshold, we subtract the threshold to obtain the net power. If the power is less than the threshold, we set the net power to zero. We will use net power in our centroid calculation so as to eliminate the influence of far-away coils. Conversely, a coil directly under the transmitter does not contribute significantly to the overall position measurement, other than to reduce the contribution of the other coils. We remove the central coil measurements of our experiment so as to obtain a position measurement from four coils arranged on a 10-cm square, with the transmitter in the center of the square. Figure: Calculated Position of Transmitter with Orientation. We use the data of our previous plot to calculate how an array of four receiving coils on a 10-cm grid would yield position with a transmitter at the center of the four. Power threshold −70 dBm to reject far-away coils. The standard deviation of position is now 15 mm, and we have a step-change in measured position of 50 mm when we go from rotation −22.5° to 0°.